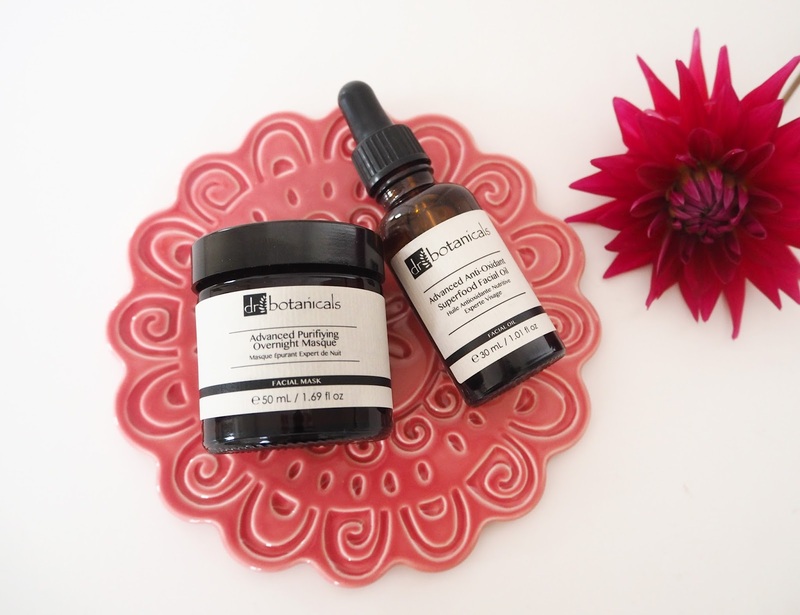 Recently I have been trying out a Skincare range that is new to me called Dr Botanicals. I was sent their Facial Oil and Night Cream to test out and see how I got on with. However I didn't start using the products straight away as my skin was having a rather bad flare up, I'm still not sure if it was due to the change in the weather or an allergy to something. I didn't want to start trying new products until my skin settled down just in case it made it worse and I didn't want that to affect my review of the products for you. My skin finally calmed down though and I've been using the products for just over 3 weeks now. I do feel that sometimes it's really beneficial to switch up your skincare products and routine, it stops your skin getting lazy or too used to one product. First impressions were that the packaging looks very high end luxury style! Reminds me a little of Aesop kind of design, very chic looking. The fragrances from both of the products, but particularly the night cream, are incredible! I can smell a rich, deep fruity aroma which is strong without being overpowering and I find it very relaxing every evening applying it, almost feeling like I'm in a spa. I do like to try and create my own spa environment at home with my candles and lovely products, it makes for a nice evening! Their products are definitely at the pricier end of the spectrum but if you're looking for some seriously luxurious skincare then I would definitely recommend giving this range a try. Get a massive 70% OFF your orders until the end of the year by entering the code BLOGDB at the checkout! 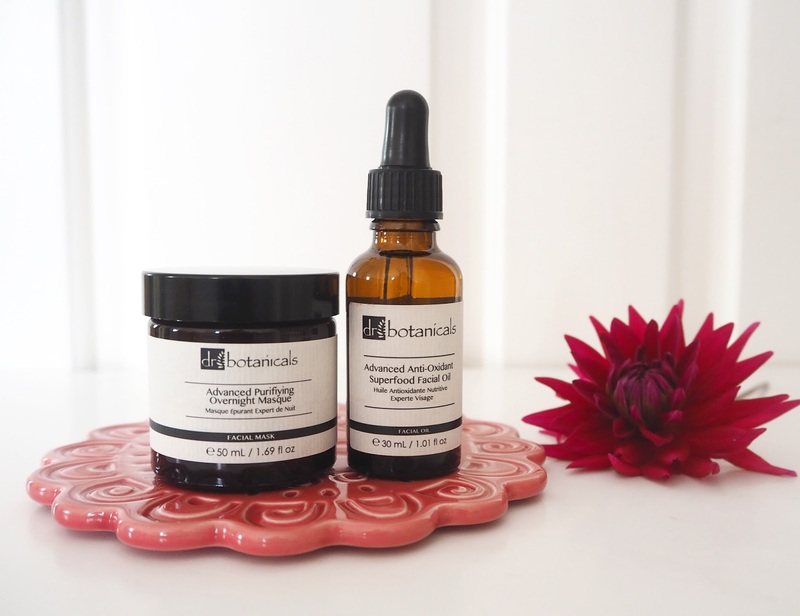 You can browse and buy the Dr Botanicals Skincare range online, and follow them on Facebook, Twitter & Instagram to keep up with the latest news on their product launches! Advanced Anti-Oxidant Superfoods Facial Oil | "Infused with vitamins, anti oxidants and minerals, this rapidly absorbed facial oil works to boost and protect the skin". This protect is designed to help protect the skin against UV exposure throughout the day as well as boosting skins renewal during the night. It contains some beautiful ingredients which include: Blackcurrent Seed Oil which helps to moisturise, nourish & strengthen for healthier looking skin. Cherry Kernel Oil acts as a UV absorber for the skin, it's rich in vitamins A and E as well as containing natural antioxidants. 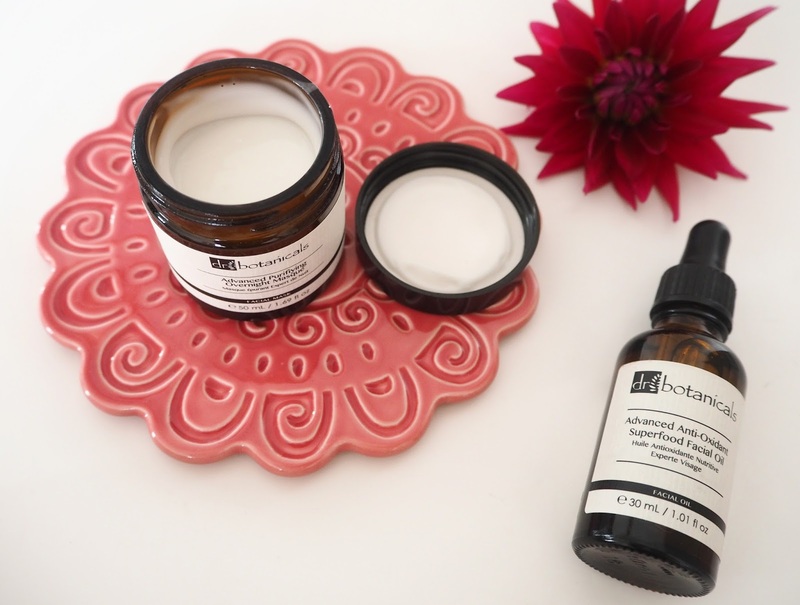 Bisabolol helps to protect and heal the skin from daily stresses & is an active ingredient derived from Chamomile so perfect to use before bed. This facial oil is a delight to use every evening for the light non sticky texture along with is lovely fragrance! For me it has a slight almond/amaretti fragrance but that might be the addition of cherry kernel oil that makes me associate with that. I use this product, as directed, every night onto cleansed & toned skin. I add two drops to my hands rub them together and gently press the product down my face and neck. 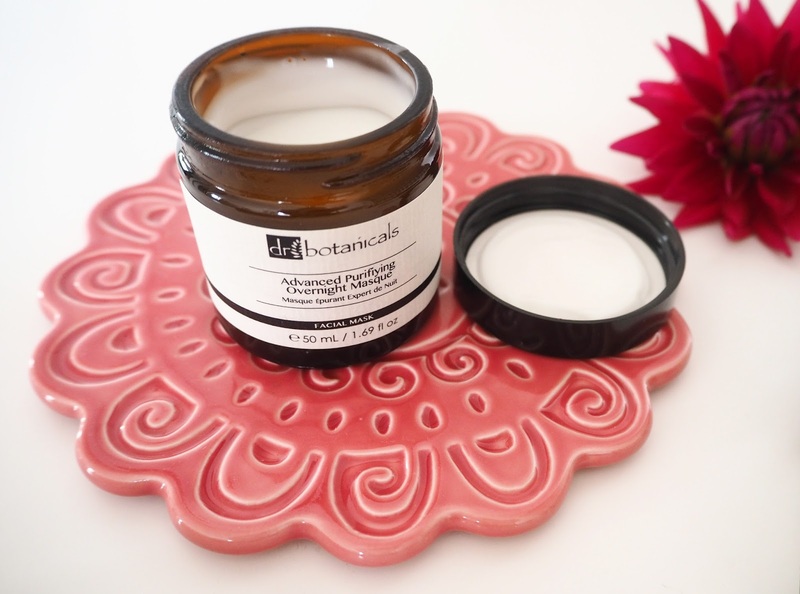 Advanced Purifying Overnight Masque | "A deeply nourishing and smoothing facial masque that aims to intensely condition the skin overnight". This night cream contains many skin loving ingredients including: Papaya, which is rich in minerals and sugars as well as vitamins C, B1, B2 and B3. Jojoba Oil which aims to enhance and rejuvenate the skin. Sweet Almond Oil, known for its softening and moisturising properties and containing essential fatty acids as well as vitamins A, B1, B2, B6 and E. As directed I apply a light layer to clean, dry skin each night after cleansing toning and using the facial oil. It absorbs quickly into the skin and although it's says facial masque you don't rinse it off - to all intents & purpose it's a night cream. I love the smell of this so much, you really get the Papaya scent coming through. Overall I'm really impressed with how well my skin has reacted to these new products it feels much softer, calmer and hydrated and I think it's been the perfect skin pick-me-up as we transition into the winter months! What are your current skincare secrets?